In total, $51.1 billion in federal dollars were spent in Colorado in 2014. If we compare to Colorado's total GDP of approximately $295 billion it does indeed match up with Pew's number of 17 percent of GDP. 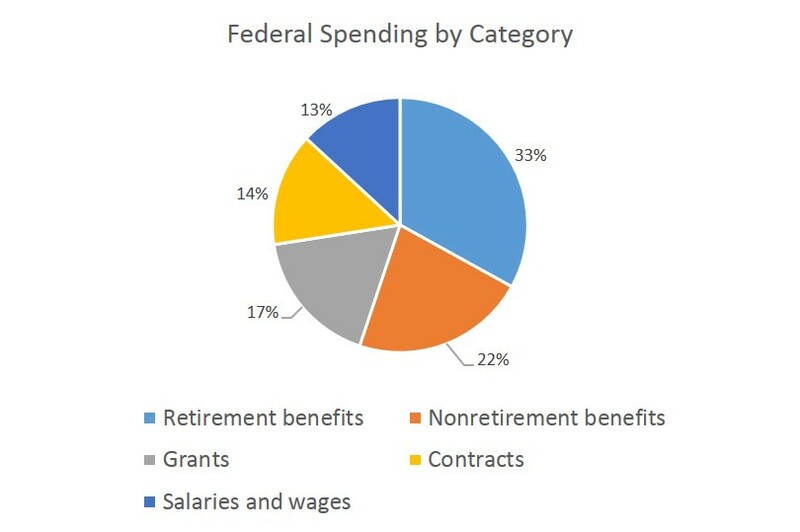 So what's driving the federal spending? Is it welfare, military spending, social security payments or something else? 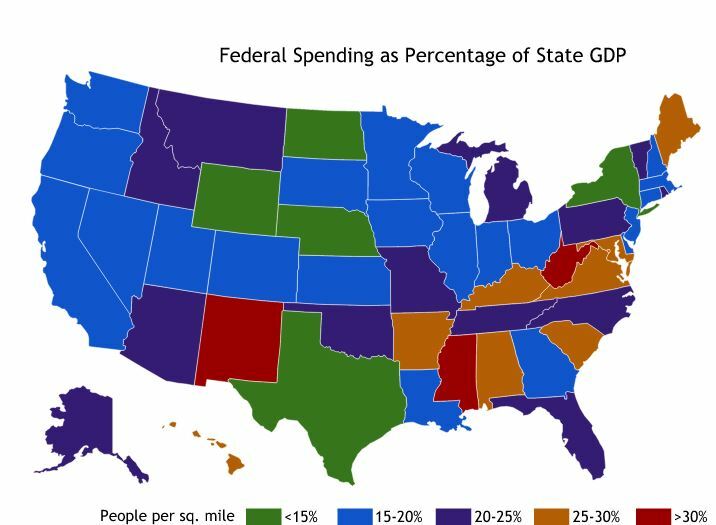 Last week, we looked at military spending by state and found that Colorado was 18th in the nation for military spending as a percentage of state GDP. This chart breaks out the components. Military spending will show up under "salaries and wages," "grants" and "contracts." As with most states, Colorado's largest piece of federal spending is found in retirement benefits such as Social Security payments. That is followed by non-retirement benefits. The Pew survey classifies Medicare as a non-retirement benefit, and it's likely that health care spending is a major component of non-retirement benefit spending. Colorado has a fairly large number of both military and non-military federal employees, and salaries and wages make up 13 percent of federal spending the state. To compare, here is the 2013 data from last year. How does Federal Spending Compare to Federal Taxes Paid by Coloradans? The Pew data by itself gives us a sense of how essential federal spending is to a local economy, but that's only one side of the federal tax equation. Coloradans also pay federal taxes. If we compare the Pew data to IRS tax revenue, we can examine how much federal tax revenue is flowing out of Colorado to Washington, DC, and how much of that comes back. It turns out that Colorado is more or a less a "break even" state in the sense that the federal government spends around one dollar of federal money for every dollar of federal tax revenue collected from Colorado. At $1.11, Colorado also falls below the nationwide number for spending vs. tax revenue since (by this measure) nationwide, the US government spends $1.21 per dollar in tax revenue. This is made possible by deficit spending. 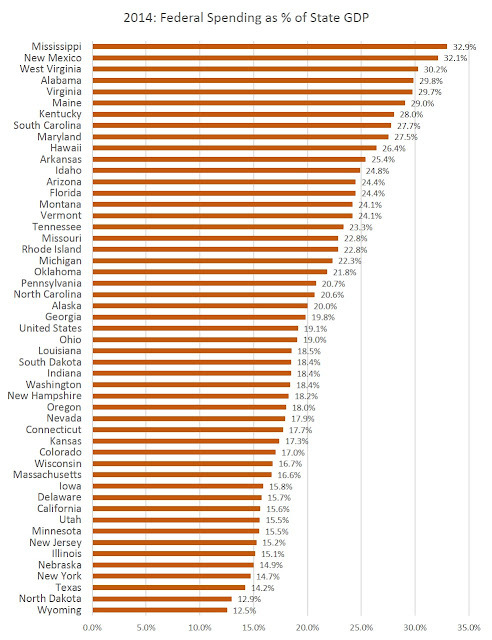 There are thus three types of states: "net tax payer" states that tend to pay in more than they receive back in federal spending; "break even" states that tend to come in near one dollar in spending for each dollar paid in; "net tax receiver" states that receive considerably more in federal spending than they pay in. If we map out the states based on how much states receive compared to taxes paid, we can put Colorado among the "break even" states. In the map, the "break even" states receive 75 cents to $1.25 per dollar paid in federal taxes. The "net tax payer" states are Nebraska, Minnesota, New Jersey, and Delaware. These states tend to pay in considerably more in tax revenue than they receive back. Numerous factors can affect whether or not a state is a net tax payer state or not. Areas that are more rural and reliant on agriculture will tend to be net tax receiver areas both because farmers and ranchers receive federal subsidies in many cases, and also because agricultural work tends to have lower productivity (in the technical sense) than urban work. Urban areas, in contrast, produce higher incomes, and therefore most of the tax revenue. 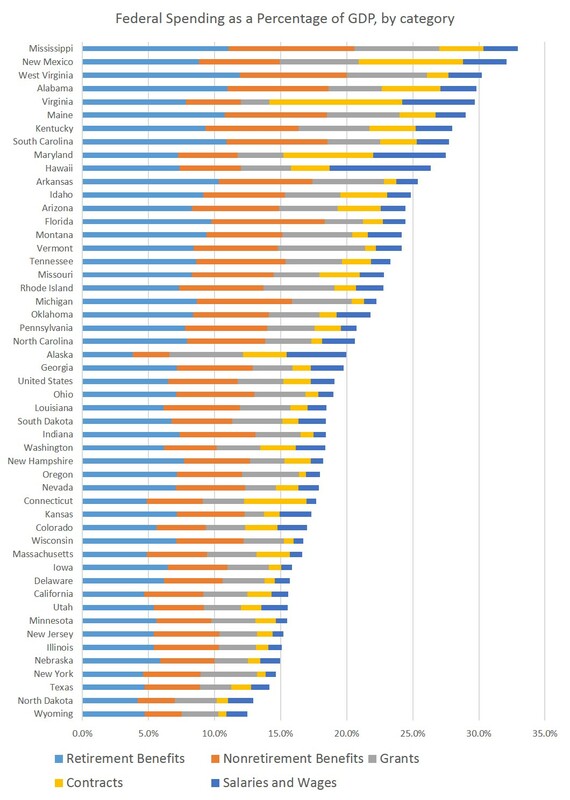 So, highly metropolitan states (which includes Colorado) will tend to more often be "break even" or "net tax payer" states. 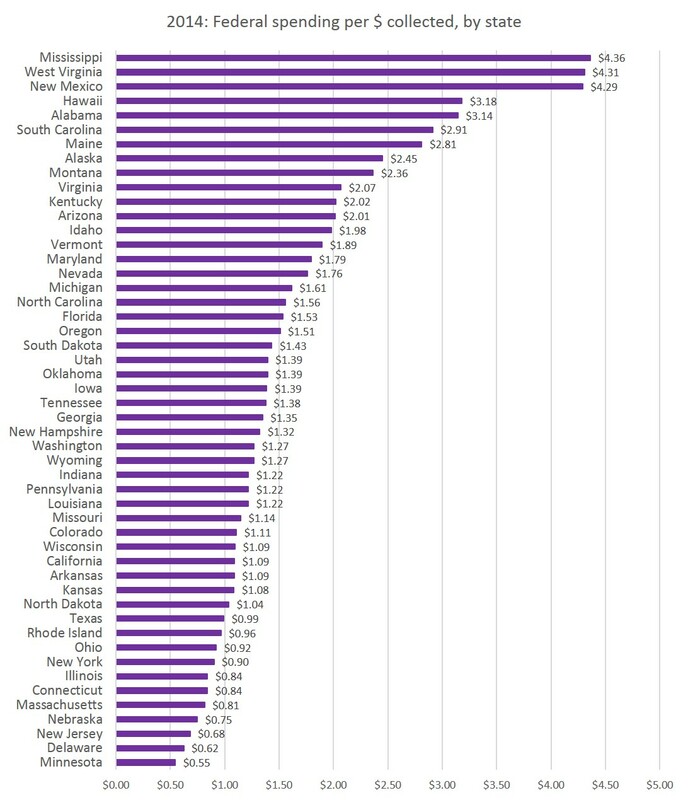 States that receive large amounts of military spending will also tend to show up as net tax receiver states, such as Virginia and South Carolina.